On this 9-day, just before tomorrow, I’d like to reflect on where we started this trecena from: 1-Ahau. To understand those who were born on an Ahau kin (and possibly trecena), try to image what your life would be like if you were born already enlightened. In Maya approach, when a nawal assumes “control” over any given period (for the day, it’s usually at dawn), it gathers the days accumulated so far, shoulders them like in a sack on its figurative back, and begins exerting its influence. This reflects the story behind the year-bearer concept. So Ahau, being the last sun-sign to many day-keepers, does that for the entire uinal. The essences of the previous 19 nawals are packed together in a dufflebag, and together make up the Ahau archetype (along with its own unique Ahau symbology). However, keep in mind that, like Ahau, every sun-sign can potentially “bear previous days on its back”, to an extent. Ahau is therefore a nawal of completeness. This also ties in with the ancestor-related influences that are represented by Ahau. The ancestors are the ones who’ve see it all, been through all the things we think are our special little problems. They’ve completed their turn on the world stage, and finalized all cycles of physical development. They are now perfect. Ahau-types are likewise aware of what perfection means, and how it could come about and manifest in the arts that they chose to engage in. This is why expectations can be an issue to them. People expect the moon of them, and they expect even more from themselves. 1-Ahau is the trecena which demonstrates de-facto that the Tzolkin is unique in its mechanics, since it maps the movement of time in both directions (past/future, back/forward in common words). Why? Well, Ahau is the last sun-sign, and its trecena is located a mere 3 trecenas (39 days) after 1-Imix – the first trecena. 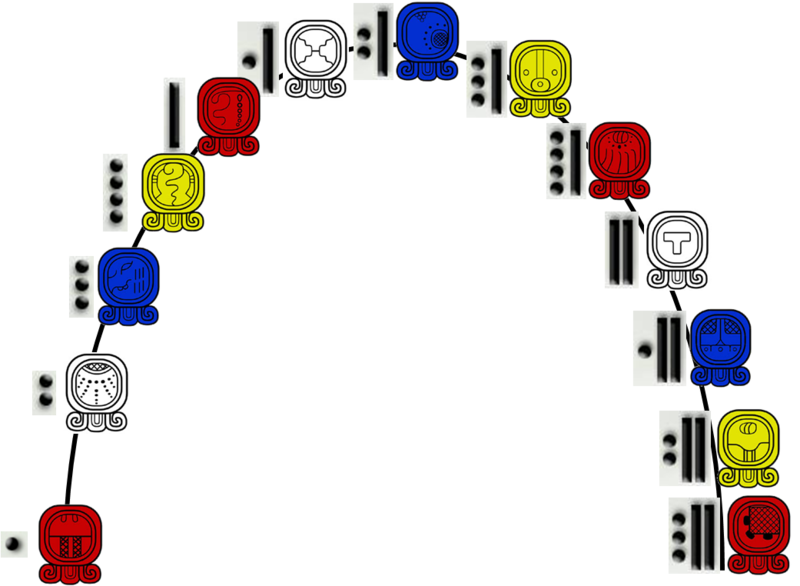 This pattern is repeated and engraved within the Tzolkin biological composition: after 39 days, 1-Ahau is followed by 1-Cauac, then 1-Edznab, etc. This is a holographic overtone built into the Tzolkin musical arrangement. It incorporates what I can simply refer to as a “double-helix”, with strands going forward and backwards in time, depending on their frequency. Actually, it a “triple/quadruple/whatever-helix”, but I won’t get into this right now. When I go back in time, and rely on the ancient wise men who lived here before my fathers, every sun-sign gets a boost. This is what this trecena is all about. So, the first sun-sign Imix (crocodile) graduated to stage 2, Ik (spirit, wind) reached the communion of 3, Akbal (night) was defined by 4, etc. Since Ahau also means enlightenment, this trecena teaches me the way to find the best wheels that have already been invented, instead of wasting time constantly starting over, reinventing whatever, and ultimately second-guessing grandpa.